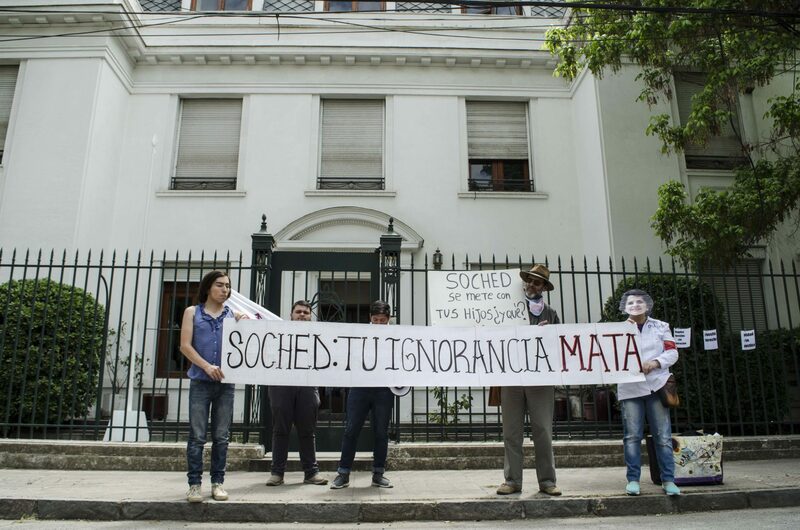 Organizations and activists of the civil society have adhered to the call of OTD Chile to demonstrate against the Society of Endocrinology and Diabetes of Chile, Soched, for its intervention during the process of the gender identity law in order to exclude children and adolescents. Through a public demonstration and the delivery of a letter to its president, Carmen Gloria Aylwin, the activists requested the departure of the pedriatric endocrinologist of the University of The Andes, María Francisca Ugarte, by the fallacious arguments exposed before the Joint Commission in order to the children under the age of 18 could not access to the recognition of their identity. They also requested public apologies for three letters sended to the Congress, jointly signed by Soched and the Chilean Pediatrics Society, Sochipe, to stop the initiative. It should be recalled that children under the age of 14 were without legal procedure to recognize their gender identity in the project approved by both chambers last September. The organizations also offered to train Soched professionals on gender identity and human rights issues to stop denormalizing and pathologizing transgender people, as they continue to request mental health certificates that endorse the gender identity of users. “We look forward to maintaining a horizontal dialogue and move forward the need to work together together to eliminate the myths and prejudices of its professionals against transgender people and to allow our community, historically marginalized and pathologized to be minimally repaired and to be recognized the responsibility that the medicine has in this. We are at the right time to move forward and you have the opportunity to recognize, as did the Congress, the principles and rights that we all have to be able to live our right for identity and health”, they said. October is the month that transgender activists in the world carry out a series of activities to stop the pathologization of diverse identities. From OTD Chile, talks and workshops have been organized for everyone. This October 26 it will be renewed a work agreement with the Legal Clinic of the Faculty of Law of the University of Chile, which has been changing the name and gender of transgender people for 6 years; in addition, the 27th of October will be held a Metropolitan Meeting of Transdiversities open to all the public. Translated by: Javiera Saavedra R.
Illuminati Club and OTD Chile announce signing contract after an incident that affected 6 activists in September.